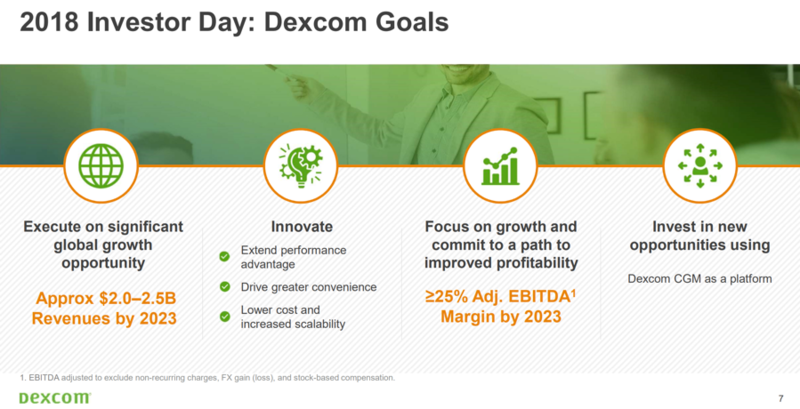 At its first-ever Investor Day, Dexcom provided five-year (2023) sales and profitability targets: (i) $2.0-$2.5 billion in revenue, more than doubling from 2018’s expectation (~$975 million) and implying ~15%-20% growth every year for the next five; and (ii) an operating margin of 15% and adjusted EBITDA margin of >25%, both up markedly from -3% and ~10% (respectively) now. These are “base case” expectations that do not contemplate new market segments, business models, or further geographies – in other words, they are conservative and only assume more CGM penetration in intensive insulin users in current geographies. We think there is lots of upside over five years. Dexcom estimates it has ~5% penetration in the 7-8 million people on intensive insulin therapy in its current focus markets. That backs out to 350,000-400,000 Dexcom users globally right now, though an installed base update was not shared today. By 2023, Dexcom aims for CGM to be “standard of care” in the ~3.2 million intensive insulin users that it estimates are in the US. By 2023, a “majority” of Dexcom’s US business is expected to go through the pharmacy. So far, pharmacy drives a >75% reduction in work effort, a >85% reduction in time to process claims, and better per-patient profits. It usually takes ~three to four weeks to get new patients on CGM via DME vs. one to two days in the pharmacy channel though not all new patient starts are seamless in the pharmacy (at least not at Walgreen’s, an anecdotal team point (n=1). 2019 launches will include a lower-cost G6 (no change to form factor) and the G6 professional CGM. A 14-day wear/one-hour warmup G6, direct-to-watch transmission, and smart pen/decision support efforts are very much in the pipeline, but no timing was attached to any of these – we’re particularly excited about CGM associated with insulin delivery beyond pumps, where we know there is especially much room to help patients improve management. In 2019, Dexcom plans for “at least three” hospital CGM studies and “up to three” gestational CGM studies – this is great. Type 2 non-intensive pilots will continue; no specific updates were shared, including on the UHC pilot – we’d love to hear an update on UHC in particular, as there had been so much excitement about these 10,000 people with type 2 diabetes on CGM in mid-2017 by UnitedHealth’s Dr. Deenen Vojta who projected “billions and billions of dollars” saved. Dexcom held its first ever Investor Day this morning, with presentations from CEO Kevin Sayer, CFO Quentin Blackford, EVP Steve Pacelli, CTO Jake Leach, and CCO Rick Doubleday. The slides are posted – CEO Overview, R&D, Commercial, Finance – and key screenshots are below. The entire four-hour webcast with audio can be accessed here. Overall, the day was fairly understated, with few major updates or truly aspirational goals. Given the excitement in CGM and Dexcom’s impressive 2018, this was a bit surprising. Management shared a five-year target to at least double sales ($2.0-$2.5 billion, +15%-20% annual growth) on further CGM penetration in the intensive insulin market. This was positioned as a conservative, base-case scenario, and upside beyond that seems highly likely to us, given the current growth trajectory and clear five-year potential in type 2 (especially with Verily). However, new markets are difficult to model and are uncertain, which meant no specifics today – pricing continues as a major question although CGM momentum is undoubtedly upon us. The most notable pipeline update came on the Verily disposable CGM, which is still targeted for an “end of 2020” initial launch. A brand-new picture was shown today, displaying the super slim side-profile of Verily Gen 2 compared to G6. Verily Gen 1 was not mentioned at all, further confirming our suspicions that a Gen 1 probably will not launch. See the key highlights below! Today’s most important slide showed a brand-new picture of the Dexcom/Verily fully disposable CGM, compared for the first time to G6. CTO Jake Leach said an initial launch is still “on track” for the “end of 2020,” with “broader commercial launch in 2021.” This is consistent with the “end of 2020” launch timing given two weeks ago, though addition of the word “broader” implied that the late 2020 launch will be fairly controlled ahead of a bigger 2021 rollout. The gen 2 product’s design is now being “finalized,” with a big internal focus on manufacturing equipment and processes to build “hundreds of millions” of fully disposable CGM sensors at scale. Dexcom will have to run “large trials” for this product (i.e., to meet the iCGM benchmarks), and feasibility studies of the gen 2 sensor are “starting right now.” The on-body profile appears less than half the thickness of the current G6 (see zoomed up picture below), which is impressive alongside significantly lower costs, fully disposable, Bluetooth real-time communication, and “extended wear” (we assume 14 days). It’s hard to know if the Verily Gen 2 size has changed since the M&M/US penny comparison picture we’ve previously seen. It’s also unclear exactly how low-cost the Verily Gen 2 is, and how it will compare to Abbott’s cost/pricing for FreeStyle Libre. (An investor asked today, but management would not comment on it.) This is clearly the most important product in Dexcom’s five-year pipeline and one that will carry Dexcom into new markets and presumably improve profitability alongside, depending on marketing investment. The Verily Gen 1 product was not mentioned once today, and we’re assuming at this point it’s not going to launch at all – given the manufacturing overhaul required to move to a full disposable, it makes a lot of sense to go from the current G6 to the lower-cost G6 in 2019 (see pipeline below) to Verily Gen 2 in late 2020 – all of that would happen within a span of two years, which is already quite tight. Indeed, comments did not distinguish today between Verily “gen 1” and “gen 2,” implying to us there is just one Verily sensor now. The 3Q18 call and Verily announcement two weeks ago said that Dexcom is “considering options” for Verily Gen 1, which was not noted today. Mr. Leach emphasized that making the Verily system entirely disposable means Dexcom will have to manufacture low-cost electronics for each individual sensor – hundreds of millions per year, up significantly from current electronics volumes (e.g., a 14-day transmitter vs. the current 90-day transmitter). He added that the Verily product design is unique among sensors, since all other CGMs have two different pieces that have to be snapped together – either by the user (e.g., current Dexcom and Medtronic CGM) or during manufacturing (e.g., with FreeStyle Libre). With Verily, the sensor is being manufactured all in one piece, which eliminates parts. 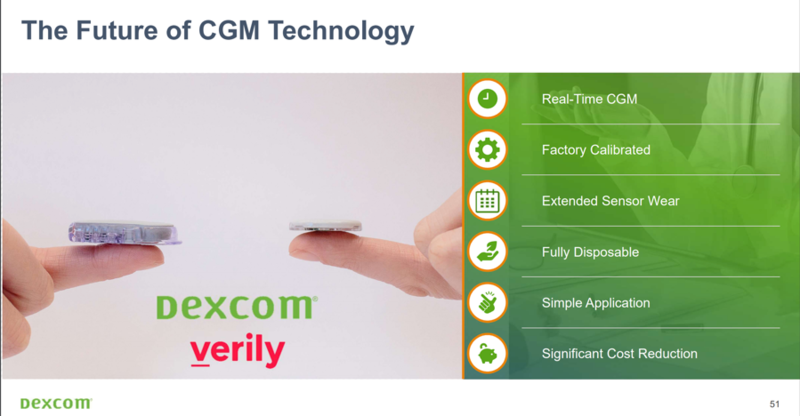 In Q&A, management clarified that the Verily platform will become the on-body experience for both intensive and non-intensive Dexcom CGM users. This is great news, as an open question has always been whether Dexcom would maintain two product lines – the current platform for intensive insulin users and the Verily disposable platform for non-intensive users. Now, it’s clearer that Dexcom plans to keep the sensor and on-body hardware the same, and differentiate between insulin and non-insulin users with software – a smart, efficient play and great news for all users to benefit from the same valuable features. Management added that the low-cost Verily product will also enable Dexcom to address emerging markets like China, Russia, Brazil, and India – this was really interesting to hear as type 2 present such major challenges to these regions. CFO Quentin Blackford briefly addressed the advantages of the amended collaboration agreement with Verily, announced two weeks ago. He noted the new agreement strengthens product development targets, increases synergy with Verily/Sanofi’s Onduo type 2 diabetes franchise (Dexcom is now the preferred CGM provider – that’s good to hear officially though we wouldn’t have imagined otherwise), offers additional Dexcom/Verily options to collaborate for the “next 10-15 years,” and eliminates all future royalty payments (giving Dexcom more financial predictability). Dexcom is paying Verily $250 million in stock, of which $235 million will go to Onduo. This upfront payment will be followed by up to $280 million in additional milestone payments to Verily upon achieving future product launch and revenue targets (not specified). Mr. Blackford noted that under the original agreement, Dexcom royalties to Verily would have represented “500 basis points of gross margin headwinds” per year over a 10-15 year period. The restructured agreement was positioned as aligning Dexcom/Verily interests; presumably they were already aligned but certainly eliminating the future royalty stream is attractive, particularly given that the pricing trajectory is unknown. Dexcom’s five-year goal for 2023 is sales of $2.0-$2.5 billion, more than doubling from 2018’s expected revenue of ~$975 million. Over the five-year period, that implies an additional $200-$300 million in annual revenue every year, or growing ~15%-20% YOY every year for the next five years. Management emphasized repeatedly that this is a “base case” and the growth does not contemplate any new business lines or further geographic expansion – it only assumes further driving CGM into intensive insulin users and current geographies. In other words, it is conservative – further upside would come from expanding CGM into non-intensive type 2 diabetes, hospital, gestational, and new geographies as well as stable pricing overall. Ultimately, at least doubling sales in five years strikes us as very doable, given the current underpenetrated market (see highlight #2) and the three-year growth trajectory – Dexcom grew 43% YOY in 2016, 25% YOY in 2017, and 36% YOY growth in 2018E. We fully expect Dexcom to drive into at least some of these new businesses within five years, as the Verily product will allow it to do so, and that’s only two years away from market. That said, management was clearly being conservative today, as these new businesses are difficult to model, especially since the revenue models are still in progress with inputs that are also hard to forecast. Improved profitability goals are covered further below in highlight #5. 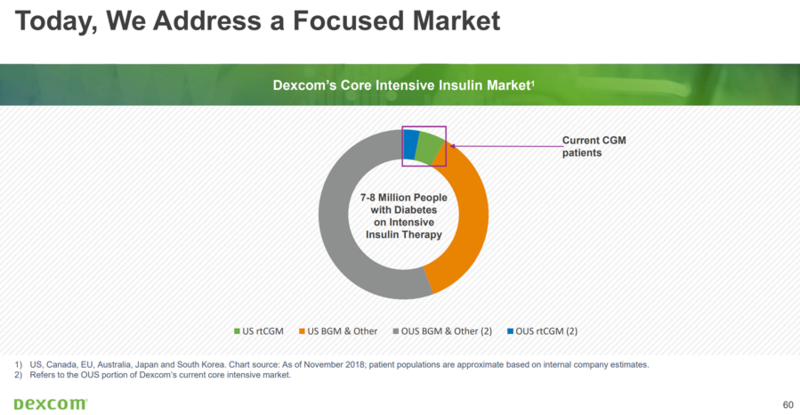 Dexcom estimates 7-8 million people are on intensive insulin in its current focus markets (US, Canada, EU, Australia, Japan, South Korea), with an estimated “5% penetration” for Dexcom CGM. That backs out to 350,000-400,000 Dexcom users globally right now, which would reflect 30%-48% growth in users from 270,000+ users at the end of 2017 – very much on par with our Q3 estimates. We were surprised management did not give a specific updated installed base metric today, though perhaps we’ll hear one at JPM next month. The takeaway, of course, is that there is tremendous runway for CGM even in the intensive insulin market in developed countries – to say nothing of other markets! We’d add that Dexcom is taking some liberties with the category inclusion criteria here, as FreeStyle Libre’s >1 million global users are being lumped in with “BGM & Other” – an unreasonable designation. 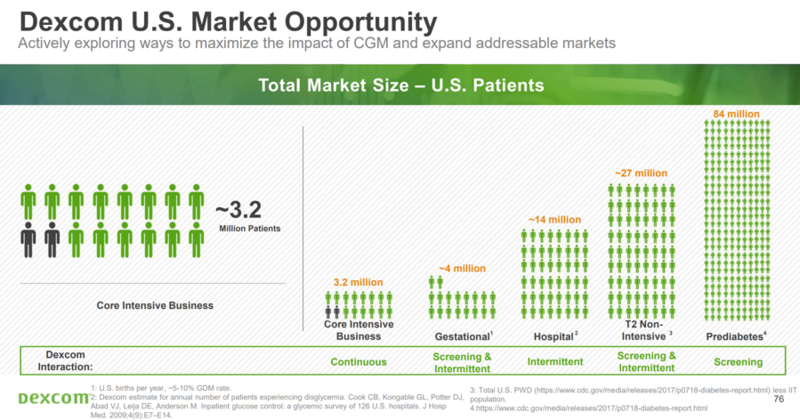 Dexcom’s 2023 goal is to make CGM “standard of care” in the estimated ~3.2 million US intensive insulin users. The US slide implied Dexcom has captured ~1/8 of these users, though the actual size of its US installed base is likely smaller than that. (The implied ~400,000 Dexcom users in the US is too high, given the above comment on ~5% intensive insulin penetration in 7-8 million potential users.) It was not specified what “standard of care” means – does that mean more than half of the ~3.2 million intensive insulin users on CGM? Does that mean CGM is widely covered for intensive insulin users among commercial payers? (Currently, Medicare covers CGM for both type 1 and type 2 intensive insulin users, whereas the latter is spotty amongst payers.) We don’t even necessarily know how many patients are “really” intensive insulin users, though this estimate of 3.2 million sounds reasonable (even conservative). “If we can get just one patient in every one of these segments to wear one sensor per year, we will need more factories.” – CEO Kevin Sayer. This was a great point on the sheer size of the larger gestational, hospital, and type 2 non-intensive markets, shown on the right side of the first slide below – even intermittent use in a small fraction of these markets is still a huge business. We are particularly enthusiastic about gestational – this should already be reimbursed and standard of care for pregnant women with diabetes or prediabetes, in our view and the same for those with diabetes in the hospital. Also by 2023, Dexcom expects the international business to represent “at least 30%” of its core intensive business. It was not specified if this referred to users or sales – presumably the latter (we assume pricing is lower virtually everywhere outside the US). For context, 3Q18 saw a record 24% of sales from outside the US, meaning Dexcom is almost there. “Reimbursement unlocks growth.” – CCO Rick Doubleday. Following German reimbursement in 2016, Dexcom’s Germany patient base has increased 10x! Dexcom now has access to ~75% of covered lives in Germany, and Mr. Doubleday said there will be more reimbursement coming outside the US – “the one certainty is the uncertainty of the timing.” However, reimbursement is expected in Spain, Italy, France, UK, Japan, Korea, and Canada, which alone are expected to add another 2-3 million people that Dexcom can target. Today, Dexcom is “primarily a DME company,” but by 2023, a “majority” of the US business is expected to go through the pharmacy – bringing per-patient profit advantages. CCO Rick Doubleday and CFO Quentin Blackford highlighted many of the benefits in a slew of interesting new data points – pharmacy distribution drives a >75% reduction in work effort, a >85% reduction in time to process claims, and greater profits and margins. In the DME channel, it usually takes ~three to four weeks and an eight-step process to get new patients on CGM; the pharmacy channel reduces this process to one to two days and just four steps. In line with 3Q18, management noted the pharmacy channel puts some pressure on the revenue line, but brings profitability advantages – a new point of emphasis. Mainly, it takes far fewer internal resources to service the pharmacy channel, something Insulet has also highlighted in recent calls. In the DME channel, Dexcom has to do heaps of legwork in securing documentation, clearing prior authorization hurdles, submitting claims, etc. – and sometimes that work has to be repeated multiple times per year. In the pharmacy channel, this goes away, and Dexcom often does not have to touch anything internally – the prescription goes from the HCP to the pharmacy, it’s processed at the register, a patient pays the copay, and the product is either dispensed immediately (it’s on the pharmacy shelf) or ordered from a wholesaler and usually delivered next day. Moving to the pharmacy is also important for MDI users, who are not accustomed to getting supplies through mail order DME. According to Dexcom’s market research, 49% of HCPs acknowledge that CGM prescriptions are impacted by required insurance documentation. Notably, >50% of HCPs would increase CGM prescription if only a pharmacy benefit or certificate of medical necessity was needed. This is pretty compelling, since it suggests pharmacy distribution could also improve physician prescribing volume – that could be huge for opening the market, especially in type 2 diabetes and prediabetes. The certificate of medical necessity is an approach Dexcom is taking to simplify the DME channel. Mr. Doubleday noted that the pharmacy channel will “never be 100%” of Dexcom’s business – in his prior career at J&J in the SMBG world, pharmacy was 75%-80% of test strips, with the remainder still running through DME. This dual benefit structure, with a majority through pharmacy, is Dexcom’s expectation mid/long-term. Dexcom receives a staggering ~100,000 phone calls per month to its inside sales team alone, of which 40% are simply to determine order status! Next year, Dexcom will launch automated email and SMS order updates, an obvious way to cut down on the volume. This is also important in the Medicare model, where Dexcom has to touch base with patients every month to confirm they want to continue receiving supplies; over time, Dexcom hopes to move to a smartphone push notification, eliminating the need to have a live interaction. Dexcom has also started to leverage “third party resources” to expand its customer support capabilities. Early feedback suggests 19%-39% call efficiencies and quality performance scores >97%. Dexcom has opened an office in the Philippines, which has helped reduce wait times and expand internal resources. (It was not specified how large the office is.) Still, management was clear that Dexcom must scale its customer support operations, and we’d agree – quality for current customer support anecdotally isn’t universally high-scoring; there have been many frustrated users with long call wait times following the G6 launch and lots of disappointments heard. Of course it’s hardly a negative problem to be facing customer service problems due to high demand. We’ve heard great enthusiasm about the G6 and believe the advantages over the G5 to be significant. An equally staggering >115,000 technical support calls are received per month, most of which are considered “tier one,” less complex issues. With third party resources, Dexcom has seen a >40% increase in call capacity with a >25% reduction in cost per call. In his presentation, CCO Rick Doubleday noted Dexcom’s strong user satisfaction (based on a 3Q18 dQ&A survey; see above – this is one of the highest NPS scores we have ever seen!) and direct-to-consumer marketing progress that now brings in ~30% of new patient opportunities. 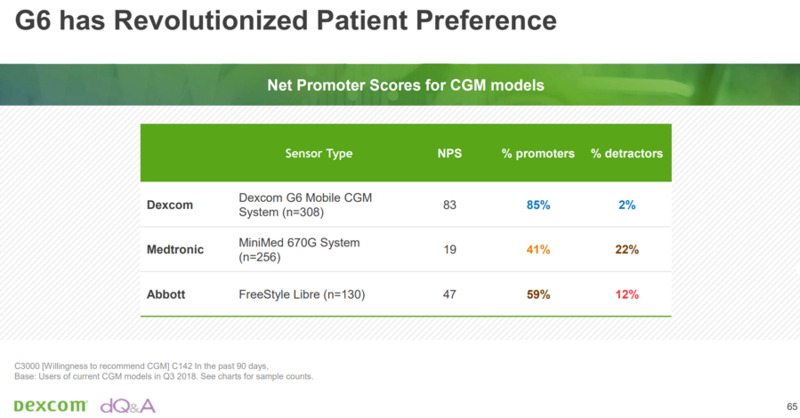 Impressively, according to dQ&A’s research, G6 has a Net Promoter Score (NPS) of 83 (n=308; 85% promoters; 2% detractors), while Abbott’s FreeStyle Libre has an NPS of 47 (n=130; 59% promoters; 12% detractors), and Medtronic’s Guardian Sensor 3 (used in tandem with 670G hybrid closed loop) has an NPS of 19 (n=256; 41% promoters; 22% detractors). It is difficult to draw head-to-head conclusions since the patient bases using each system may have underlying discrepancies (e.g., socioeconomic, age, type 1/type 2 diabetes, etc. ); that said, the data do demonstrate tremendous satisfaction with the new Dexcom sensor, likely driven by no calibrations, great accuracy, the one-button applicator, and 10-day wear (especially for prior G5 users). 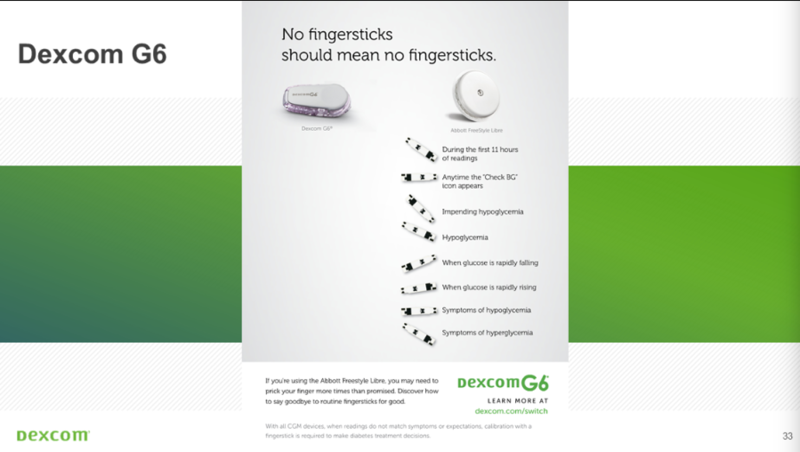 Notably, over half of Dexcom customers in the US are on G6, in line with 3Q18 comments and reflecting rapid uptake. Globally, G6 is currently in 16 countries (up from 14 as of 3Q18), with more to come in 2019. Since Dexcom commenced direct-to-consumer (DTC) advertising in 2015, US new patient opportunities have risen ~4x – the strategy now brings in nearly a third of new patient opportunities! Mr. Doubleday explained how campaigns such as CGM First and Dexcom Warriors have reduced marketing friction, encouraging patients to ask their providers if CGM is right for them, as opposed to waiting for a provider’s recommendation (this will change in the future but many doctors still perceive Dexcom as unchanged from many versions ago, etc). Given that so many people with diabetes in the US are primarily managed by PCPs who may not be as familiar or confident with CGM as endos, it’s not a huge surprise that the strategy of increasing patient demand by “going direct” has made a huge difference in the number of patients coming through the door. Adding to his CGM First reference, Mr. Doubleday noted that the installed base is “well north of 50%” MDI today,” as compared to ~30% three years ago. In fact, the “vast majority” of new patient adds today in the US are on MDI. This segment remains a large source of growth for Dexcom, and the bulk of key opinion leader commentary continues to emphasize that if given the choice between pump and CGM, patients and their providers should choose CGM. 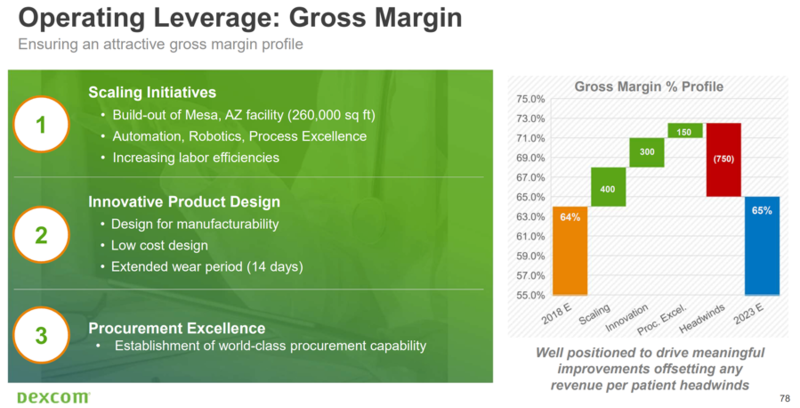 As it doubles revenue, Dexcom also plans to deliver substantially improved profitability – an operating margin of 15% and adjusted EBITDA margin of >25% by 2023. For context, these currently stand at -3% and ~10%, respectively, meaning profitability will actually grow faster than sales over the coming five years. In the base case of $2.0 billion in revenue, this means Dexcom will generate $500 million in positive cash flow in 2023. CFO Quentin Blackford noted that as Dexcom gets closer to these targets, it may increase the goals further. Gross margin is expected to remain level at ~65% by 2023, balancing margin improvements in scale/innovation/procurement amidst lower per-patient revenue headwinds. The latter will reflect the shift to the pharmacy, more Medicare business, and greater OUS mix – trends that have been pointed out for several quarterly calls now. We also think US pricing pressure will continue. Mr. Sayer touted recent FDA 510(k) clearances – the “Pro Q” professional G6 CGM and the G6 Glucose Program (real-time iCGM for non-intensive diabetes management) – and their potential to drive outcomes in type 2 diabetes, not to mention lower cost (he said the average type 2 costs payers ~$17,000 per year). 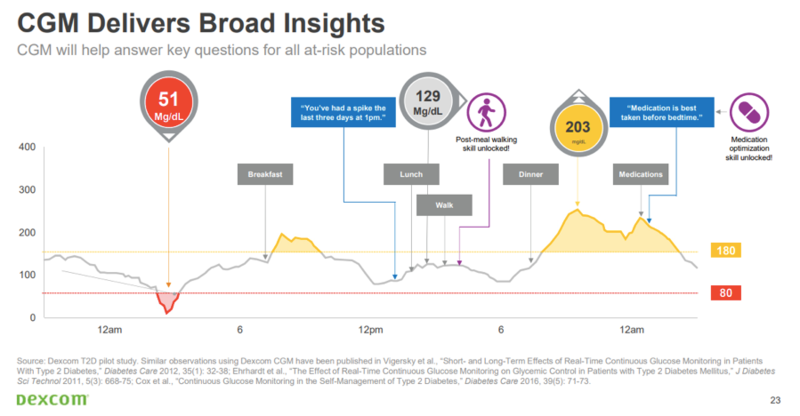 Dexcom is currently running a number of pilots in non-intensive type 2 diabetes where patients are given a sensor, asked to track exercise and meals, and receive coaching (depending on disease severity). Management reports that the most important thing to commercial payers is to reduce drug cost; to keep patients from taking the next most expensive compound or show that one isn’t working and should therefore be stopped. Cost may prohibit type 2s from wearing CGM all the time in the near-term, but Dexcom’s goal with the non-intensive diabetes management program (and other efforts with Onduo and UHC) is to assess disease state, assign a wearable sensor, teach skills, optimize medication, and compile data. Mr. Sayer called this application “programmatic,” rather than real-time. For example, for a patient going on an oral diabetes drug that costs $400 per month, “wouldn’t it be nice to know that it works? Would it be reasonable to know if highs are being eliminated if you wear CGM for two weeks? Once the drugs work, education can make you healthier.” As far as education goes, Mr. Sayer noted that Dexcom’s program gives patients information – e.g., “Take your medication at the same time each day” – whereby they can make gains in their glycemic management. Mr. Sayer noted that there are 27 million type 2s in the US, so even if each gets one sensor at any price point, there’s a large opportunity for Dexcom to sell “millions and millions” of sensors. Some will benefit from a single two-week, retrospective sensor, he said; others will want to wear 2-4 sensors to learn over the course of 2-4 months, and have periodic CGM checkups moving forward; and in the extreme cases, some type 2 patients may benefit most from full-time CGM. No matter the mix, Mr. Sayer sees “numerous sales and volume opportunities” in this large, heterogeneous population – part of it depends on the zeroing in on models that best meet payer expectations for cost. 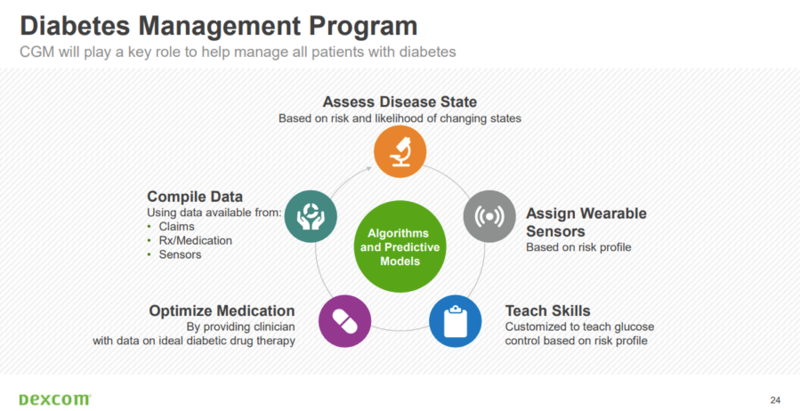 Dexcom remains open to strategic partnerships, joint ventures, and acquisition, particularly around developing software for type 2 diabetes. Beyond Verily work on the hardware, it has the pilot in type 2 diabetes with Fitbit/UnitedHealthcare, the work with Onduo (Sanofi/Verily), and possibly other efforts. Dexcom is planning at least three hospital studies in 2019. 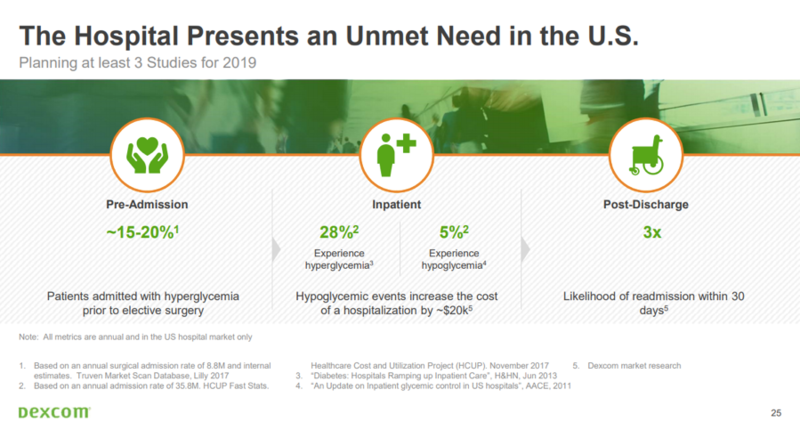 Management didn’t give granularity on setting, though the below slide mentioned potential applications in pre-admission, inpatient (where hypoglycemia increases cost of a hospitalization by $20,000! ), and post-discharge. In addition, a prior slide listed surgery (CV/ortho), pre- to post-op, and ICU as hospital opportunities. The literature shows there’s a clear opportunity for tremendously improved outcomes and cost-savings around procedures and hospital stays that can be easily complicated by hyperglycemia and hypoglycemia. We wonder which pathway(s) Dexcom will use as an entry point into the hospital setting; presumably the team has targeted a high-risk setting where cost-savings are most probable, as that could get the technology early traction and awareness, which could then expand to other hospital applications. Read Adam’s recent hospital experience with CGM; the article has been viewed over 15,000 times, and we’ve received hundreds of emails similarly emphasizing the huge need for CGM to move into the hospital. We could not agree more – regrettably, the NICE-SUGAR study was ahead of its time. 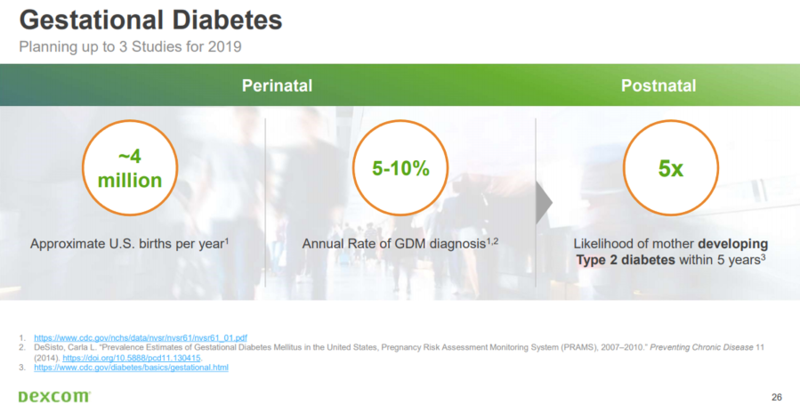 Up to three studies are planned for gestational diabetes (GDM) in 2019. It’s not clear if these trials will be limited to people with GDM, include pregnancies of people with diabetes, or both. Either way, we’re elated to see a focus here, if for no other reason than the stat on the right side of the below slide: a mother who has had GDM has a 5x risk of developing type 2 diabetes within five years! Considering there is also a far higher probability that the child of a GDM pregnancy will develop type 2 diabetes, pregnancy is a prime target for prevention. At AADE, NIDDK’s Dr. Judy Fradkin underscored NIH’s interest in using CGM to understand: (i) when in the course of pregnancy glucose levels become elevated; (ii) whether earlier diagnosis and treatment would prevent metabolic sequela in mother and offspring; and (iii) the best treatment options. Management is still exploring risk sharing models in type 2 diabetes, though Mr. Doubleday suggested that payers are for the most part not yet ready to enter into such agreements: “Many don’t have the backend data to take that on. A lot of it really is just a rebate kicker today.” He added that Dexcom would love to lead the way there. We’ve seen Medtronic offer an outcomes-based guarantee (offering to pay up to $25,000 over four years for hospitalizations related to 670G) and some risk-sharing in digital health/remote care (most recently with Virta going 100% at risk), though we’d love to see more of the field move in the direction of aligned incentives – payment for outcomes, rather than volume/acute episodes. “6% of patients achieve desired outcomes. We have an opportunity to make things a lot better.” – CEO Kevin Sayer. A slide showed the compelling “Rule of Halves,” something Novo Nordisk has shared quite a bit over the years. 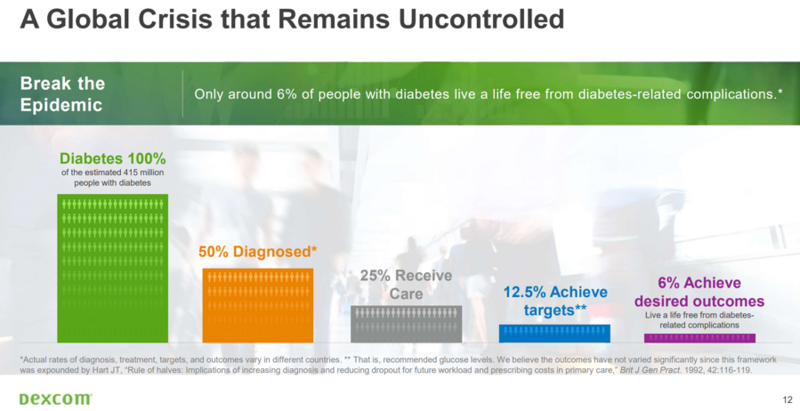 This slide takes a global and non-intensive diabetes perspective, which was not really the focus of Dexcom’s penetration commentary today. Still, it was still a good reminder of the market runway. “No routine fingersticks” – Yes for G6, no for FreeStyle Libre. We find this website language to be misleading, as routine implies periodicity, though Libre does have more scenarios in which a fingerstick is recommended. In addition, G6’s two-hour warmup is currently twice as long as Libre’s one-hour warmup (though Dexcom is moving to push G6 to one hour as well, it doesn’t have this now). G6’s MARD is 9.0% vs. Libre’s 9.7%. The latter is actually for the 10-day sensor, as Abbott reports an updated MARD of 9.4% for its 14-day sensor. FDA’s SSED for Libre noted a MARD of 10.1%. The difference came down to a difference in methodology (details here), which Mr. Sayer called out in today’s call (see below). G6 has a pediatric indication (ages 2+) while Libre is indicated for 18 years and up. A submission for a Libre indication down to age 4 is currently with FDA. The comparison also reports: G6 has custom predictive alerts and alarms (the next-gen Libre with optional alarms should be rolling out in the EU soon); a follow function; mobile device connectivity (though Abbott does have FreeStyle LibreLink in the EU and for iOS in the US); insulin pump integration (Abbott is working with Bigfoot on closed- and open-loop systems); no known interferants (Ascorbic and Salicylic acid are Libre interferants); and meets iCGM special controls. Overall, for a company to focus on a competitor in ads is not a good use of funds in our view – there are so many patients not on CGM and they should be the focus rather than “switch”. The page conveniently leaves out FreeStyle Libre’s advantages over G6: longer 14-day wear, lower upfront cost, fully disposable design (no reusable component), and broader pharmacy access (for now). He noted Abbott’s 14-day labeled MARD calculation with a basketball analogy: “If I could shoot two free throws and only count the one I make, I would have been spectacular. Performance matters. It will always matter. I want a sensor that performs.” The reference was apt: each of Abbott’s 95 trial participants wore two 14-day sensors (one on the back of each upper arm); While FDA analyzed data from the primary sensor (the first applied sensor for each patient), Abbott analyzed data from the longest-lived sensor from each subject. The MARDs were therefore different: 10.1% (FDA) and 9.4% (Abbott). This analogy misses the forest for the trees in our view – the accuracy of Dexcom vs. Abbott is just not material. It was not so long ago that SMBG was the only game in town and accuracy was twice as bad with no trend arrows and accuracy made worse by things like dirty fingers! Later, Mr. Sayer commented on Abbott’s 1+ million global user base: “We know our users are active. What is an active user? If we counted a patient as everyone who’s ever bought a receiver, they’d count, but they’re not all active.” Abbott most recently shared on its 3Q18 call that it had surpassed one million users globally – Mr. Sayer was calling into question how many of those 1+ million people are considered active, and by what criteria. We’d note that Dexcom has also not shared “active user” metrics or criteria; in its last user base update at the end of 2017, the company’s user base was over 270,000, and comments today (See above) suggested it is now over 350,000. Four years ago, Ms. Cheney and her husband Justin adopted their son Oliver from Uganda. The couple traveled to Africa with a plan to get a Visa for Oliver and bring him home within three months. This plan was complicated when they realized that he was very sick and blood transfusions were the only thing keeping him alive. During this tumultuous time, Ms. Cheney noticed that she was feeling tired – she asked her husband to carry Oliver around (though she had previously fought him for the privilege), she would fall when she got out of bed in the middle of the night to check on Oliver, she drank a lot of water, and she urinated a lot – but chalked it all up as “new mom tired” and to being in Africa. At this point, she was (falsely) diagnosed with parasites, and two months into the trip decided to go home to recover. Through her parasite treatment, she kept getting worse and eventually moved in with her parents. One day, when she was too weak to get to the fridge, struggling to breathe, and couldn’t see (“everything was completely white”) her mom took her to the ER, where she promptly fell into a coma. It was only when she awoke that she was informed she had type 1 diabetes – all while her husband and new son were 9,000 miles away. Mr. Cheney flew to the US to help his wife get back on her feet, and the two returned to Uganda to be with Oliver. Coincidentally, one of Ms. Cheney’s friends runs an organization in Uganda and, soon after they returned to Uganda, she called her to tell her about a little girl who was diagnosed with type 1 diabetes and was in need of a foster family. Ms. Cheney said the decision to adopt was the “easiest yes.” At the time of adoption, the 12-month-old Oliver and the six-year-old Zola both weighed 20 pounds. Ms. Cheney joked that the family of four – with a healthy Oliver in tow – flew back to the US two functioning pancreases short. Ms. Cheney explained measures she and her husband would take to get diabetes supplies in Uganda: They’d hitch rides on the back of motorcycles to pharmacies, where any insulin they’d find is likely expired, and they couldn’t find syringes. So they hired a driver to take them to Kampala, the capital that was a three-six hour drive away from their town. Even there, still no syringes. They eventually had Ms. Cheney’s mom and friend in the US mail packages of diabetes supplies to Americans who they found out via social media would be traveling to Uganda. The stranger would bring the supplies in a suitcase, which would be handed off to Mr. Cheney (who had hired a driver to take him on the five-hour journey). With the help of CGM, Ms. Cheney has brought her A1c down from 14.1% at diagnosis to 5.3%, and she and Zola target an blood glucose of 83 mg/dl – quite aggressive! Even during Zola’s first ever week of school in the US – the thought of which had caused much anxiety in the Cheney family – she was able to maintain near-normal levels of time in a tight range of 70-150 mg/dl! “This never would’ve been possible without this technology.” Ms. Cheney explained that CGM is so critical because it allows people to act proactively as opposed to reactively. 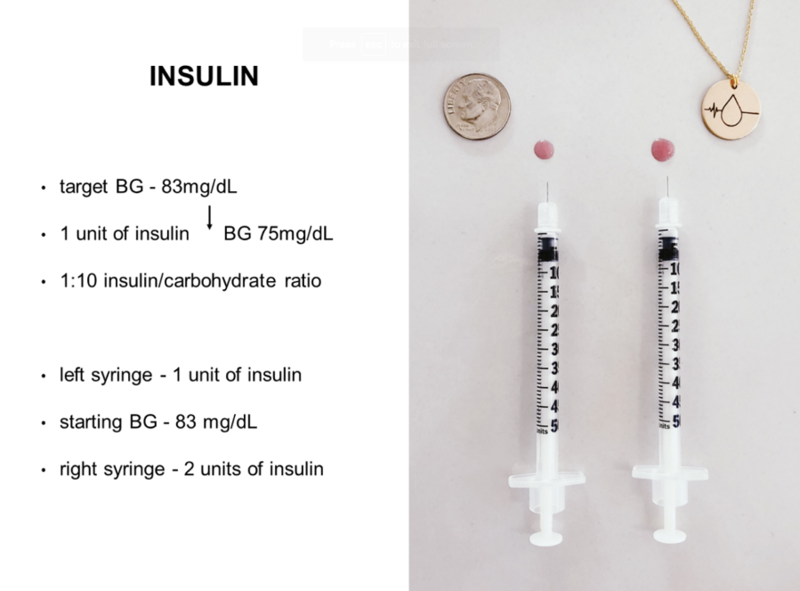 She displayed a compelling slide showing the minute difference between one unit and two units of insulin – a small margin of error for someone with high insulin sensitivity. Should she deliver too much insulin, CGM allows her to catch the downward trend before it becomes an emergency. Of note: Ms. Cheney is also a photographer who is responsible for the chic photo of the Dexcom-Verily Gen 2 sensor featured below. “Pro Q,” the fully-disposable G6 professional iCGM cleared for retrospective use in all people ages 2+, will launch “next year” (in 2019). We first heard about this clearance during the 3Q18 call. Management mentioned during today’s proceedings that Pro Q will help push beyond intensive management, as it is indicated for intermittent use in all people with diabetes (in fact, the indication is for “all people,” meaning those with prediabetes also qualify!). Management also acknowledged the potential to offer medication titration and the fact that professional CGM has established reimbursement codes as positive trends that could support a successful launch next year. We wish a picture of it had been shown today, as we have not seen what the disposable hardware looks like; presumably it is the same form factor as the current G6 transmitter, but we’re not positive. There are still other unknowns about this device, such as whether it will display real-time data (like the G4 professional version), or whether it’ll be exclusively blinded/retrospective like Medtronic’s iPro2 and Abbott’s FreeStyle Libre Pro. Either way, we’re looking forward to an updated professional product from Dexcom, an area with huge potential runway for the CGM market and a potential funnel to get more patients/HCPs familiar with CGM. We also wonder how Pro Q’s software, decision support, and cost profile will compare to existing options. Aligning with 2Q18 guidance, management anticipates bringing a lower-cost G6 to market in 2019. Per 2Q18, the cost-savings are realized in a redesigned transmitter – G6 features and functionality are retained, but the transmitter is “a whole lot less costly to produce,” offering a nice opportunity on the margins side (we do not yet have a sense of what is driving this). Mr. Blackford exclaimed during Q&A that cost of production is “significantly less, orders of magnitude less,” though we would be surprised if it were truly an order (10x) or orders (>100x) less costly to produce. By way of hyperbole, however, he effectively conveyed that the lower cost design could help drive margins. (According to the company, transmitter revenue was 18% of sales in 3Q18.) Mr. Blackford did not speculate as to how the lower cost transmitter launch would affect finances in 2019, since exact cost of full-scale production and ending inventory levels of the current higher-cost product are TBD. There was no update on the quest to advance G6 to 14-day-wear and 1-hour warmup from the current 10-day, 2-hour warmup product. The enhancement would match the just-launched FreeStyle Libre 14-day. Mr. Leach re-presented data from a small study (n=78) of 14-day wear and 1-hour warmup shown at DTM; as we noted at the time, the data look quite good, with MARD still under 10% – including between hour 1-2 – and 91.9%-93.7% of points within 20% of 20 mg/dl. As at DTM, management said that a larger trial will be needed to show that this use of the sensor still meets iCGM standards; far more patients/paired points will be needed considering that iCGM indication looks at the lower bound of the one-sided 95% confidence interval. 40% longer wear would be welcomed by users with open arms, but Mr. Leach also pointed out the “terrific impact” it could have on gross margin. For example, in subscription-based models like Medicare, individuals would need two sensors per month instead of three, whereas Dexcom would receive the same monthly revenue. Dexcom is still “working on” direct-to-Apple Watch capability, though there was no update on timing. At Keystone, Mr. Sayer said we could expect this sometime in 2019. One Drop’s BGM can now send data direct-to-Apple Watch, so hopefully the path has been paved here. Mr. Leach reiterated many of the TypeZero analytics pipeline commentary from DTM, including MDI decision support plans (CGM-based bolus calculator, exercise and sleep advice) and planned Control-IQ algorithm enhancements (increased time-in-range, simplified startup and meal announcement, full automation without meal announcement, and personalization based on a patient’s data signature). Both Lilly and Novo Nordisk were acknowledged as smart pen partners, and management emphasized that MDI decision support (smart pens + CGM) could enable “significant” improvements in a “highly cost-effective option.” There was surprisingly little detail in this section and no timing shared; the 3Q18 call expected more smart pen/decision support pilots in 2019, followed by a broader 2020 launch. 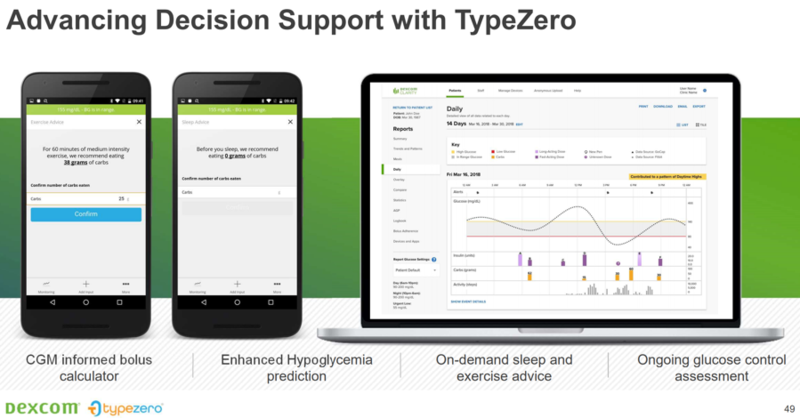 Mr. Leach reiterated the pilot TypeZero data presented at DTM by Dr. Marc Breton, which showed a positive trend towards reduced hypoglycemia with smart pens/decision support. The nearest term launch will be the TypeZero hybrid closed loop algorithm as part of Tandem’s Control-IQ system (summer 2019 launch; see Tandem 3Q18). Mr. Pacelli did note that a big motivator for the TypeZero acquisition was to enable Dexcom to “control its destiny” on the AID front, which makes a lot of sense. 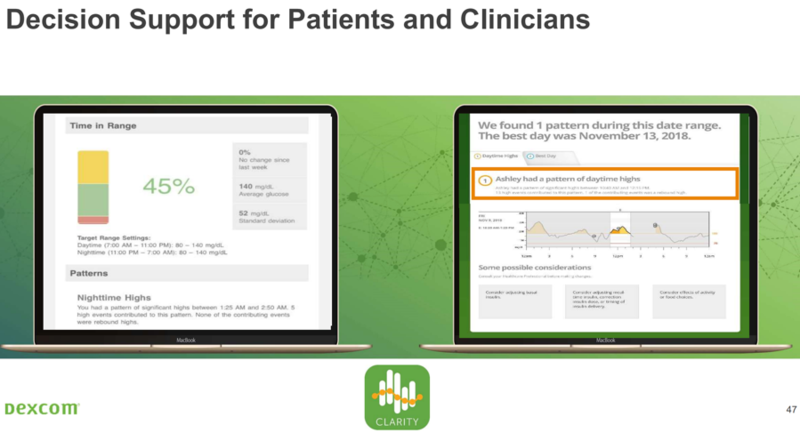 Dexcom is also working on better Clarity decision support for patients and clinicians, including insulin, exercise, and mealtime recommendations based on retrospective CGM data. The slide mockup showed “some possible considerations,” similar to what Medtronic has done with CareLink Pro and Pattern Snapshot. There are no specifics to share here, though this is an obvious and critical area for Dexcom to expand into. In what looked like a new Clarity Mobile feature, the app will allow users to set time-in-range goals and share “On The Bright Side” messages – nice! Adam has been calling for a “Bright Spots” focus in CGM data for well over a year now, and we hope to see much more of this in all CGMs – real-time data and alarms can drive a lot of negative feelings, and giving people positive, reinforcing notifications when they are doing well could change the technology’s tone in an extremely positive direction. 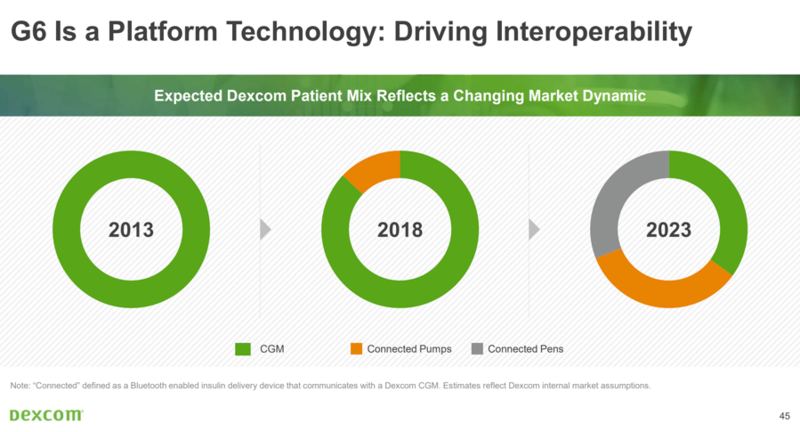 In five years, Dexcom expects more than half of its user base will be using a connected pump or pen, up from ~1/8 of users right now. 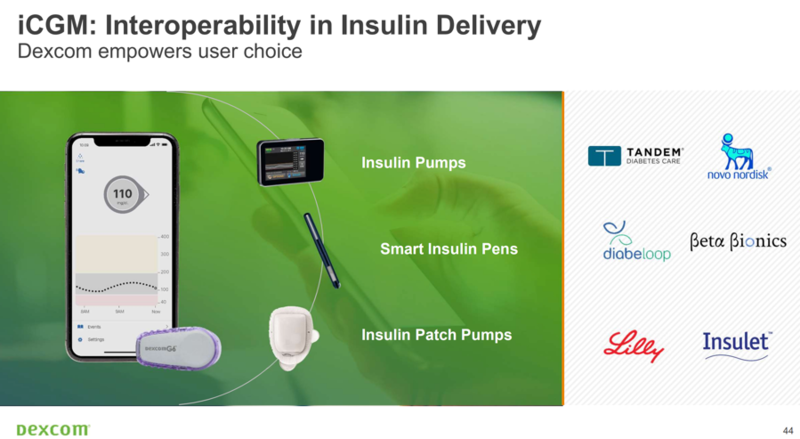 The slide below suggested the number using connected pumps will more than double and be equal to the number Dexcom expects to be on connected pens in five years. These estimates are based on “Dexcom internal market assumptions”; the pump number seems realistic, though the connected pen number is harder to call and will depend on how quickly that exciting market is built. In line with previous comments, Mr. Leach highlighted the interoperability advantages of the iCGM designation for Dexcom’s insulin delivery partners – the slide listed Tandem, Insulet, Beta Bionics, Diabeloop, Novo Nordisk, and Lilly and this list will continue to grow. Mr. Leach highlighted Tandem’s Basal-IQ approval with G6 as the first iCGM-compatible pump, which “shows the benefit” of this indication – read more on that here.